Ajay Ghale just can't catch a break. First, the intrepid Far Cry 4 hero ends up stranded when his helicopter crashes in the Himalayas. Then he manages to annoy a mysterious and not-averse-to-violence cult. And in case that's not bad enough, it turns out that he's actually stuck in the Valley of the Yetis, and you know what that means: That's right, the clue was in the title. Yetis. 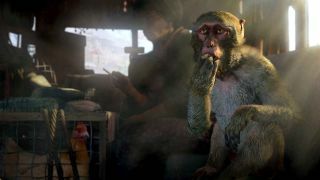 The one thing ol' Ajay has going for him is that he's handy with a gat, and based on this trailer, he'll be putting lots of them to use in more or less the same manner he did in the original Far Cry 4: Going to exciting new places, meeting interesting people, and filling them full of lead. Hey, a guy's gotta go with what he knows. Or "guys," as the case may be, as Valley of the Yetis will support both single-player and co-op mayhem. Valley of the Yetis is included as part of the Far Cry 4 season pass, and will also be available for purchase separately. It comes out on March 10.